One of the most environmentally friendly part of an internal combustion engine is the catalytic converter. A catalytic converter is a conversion unit in an engine that helps reduce the pollution of an engine by reducing the carbon in the exhaust. These units are widespread and common throughout the automobile industry throughout the entire United States. As a crucial part of the exhaust system, they are a crucial part of what we do at Schulz Garage! One of the biggest pollutants caused by automobiles upon the environment is caused by the release of carbon into the air. A catalytic converter does this by oxidizing the pollutants that are going through the exhaust. This causes carbon monoxide (CO) in the engine to be released as carbon dioxide (CO2), which is far cleaner for the air that we breath. This simple component makes the atmosphere healthier for people, and makes cleaner air for everyone. Because of this, there’s a strong aspect of environmentalism that goes into the work that we do with catalytic converters. Nitrogen Oxides: Cause smog and acid rain. They are converted to nitrogen and oxygen. Carbon Monoxide: Crowds out the oxygen in air-breathing animals (including us). It is converted into carbon dioxide. Hydrocarbons: Produce smog. They are converted into water and carbon dioxide. 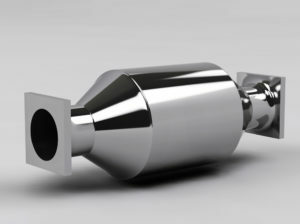 Environmentally friendly advancements in the auto industry have refined the catalytic converter so it can neutralize more gases, and have reduced the amount of harmful gases produced by the engine in the first place. You push on the gas, but your car doesn’t accelerate. Your RPMs are not climbing at their normal rate. The engine stalls after a few minutes of running. Bringing your car in for regular maintenance on the ignition system is the best way to avoid problems with the catalytic converter. Call Schulz Garage today to set up an appointment to get your catalytic converter checked!